RICHMOND has been vindicated for its aggressive off-season recruiting and new attacking game style, launching the new season at the MCG with a 43-point win over a young and brave Carlton on Thursday night. Dominant for the first two quarters, the Tigers stumbled in the third but recovered to win the now traditional season opener for the fourth straight season, 20.12 (132) to 14.5 (89). 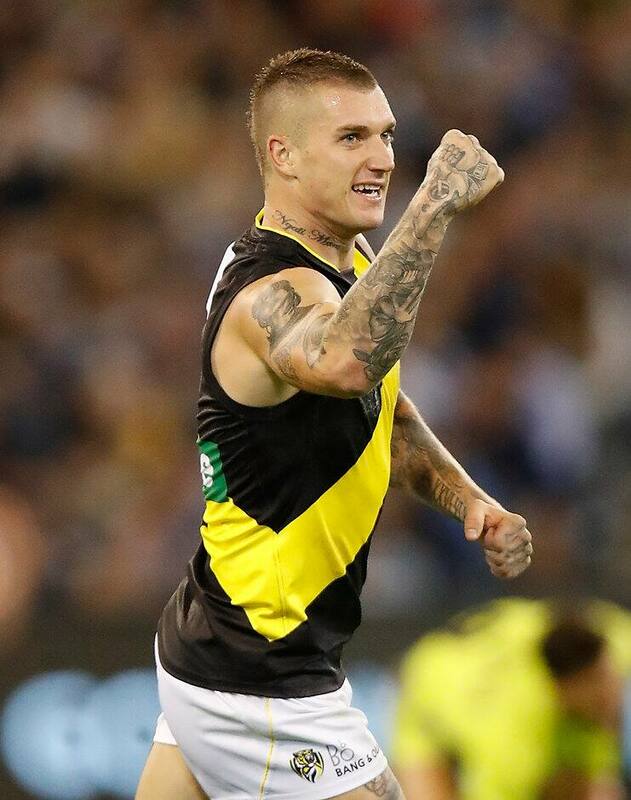 The match was up for grabs after Carlton rallied to cut a 44-point margin to 25 points at the final change, but it was outstanding midfielder Dustin Martin who asserted himself to seal the result. In the opening minute of the final term he fended off Sam Docherty in trademark fashion to set up a 50m goal for Daniel Rioli, which stretched the margin to 32 points. Minutes later he launched a 75m torpedo from the back of the centre square, allowing recruit Josh Caddy to run on inside 50 and soccer through the goal that broke Carlton's back. Martin was brilliant all night after an off-season of speculation on his future, spending more time in attack to finish with 33 possessions, four goals, six inside 50s and six clearances. He relished the Tigers' new attacking style, which provided him with space when positioned inside 50 and allowed him to carve through the midfield with direct play when stationed up the ground. He was well supported by midfield recruit Dion Prestia (28 possessions and six clearances), who slotted into the centre square and allowed captain Trent Cotchin (18 and one goal) to spend long minutes rotating as the Tigers' deepest forward. It was a good night for all four of Richmond's debutants, with ruckman Toby Nankervis throwing his weight around at stoppages to finish with 27 hit-outs and two goals, while forward Dan Butler (two goals and five inside 50s) impressed. The additions of Butler and elevated rookie Jason Castagna gave the team a small and mobile forward line that applied pressure unlike the Tigers of recent seasons. Their final tackle count of 88 (20 more than Carlton's 68) was more than the team had registered in any game last season. "I thought our defensive press was really good tonight and I thought our pressure up forward was outstanding and certainly led to a number of scores from turnovers," coach Damien Hardwick said. "I think we kicked 11 goals from forward-half turnovers, which is a number we haven't had for a long time. "To see our forwards and mids put on the pressure they did, and our backs capture those errors was a great sight I think for our fans." Hardwick promised to take his foot off the brakes this season and the Tigers' attacking approach was on show from the opening minutes as they ran in waves and handballed through traffic. They built a 44-point lead halfway through the second quarter, with Martin twice finding space inside 50 to snap classy goals as Richmond's high handball game came off effortlessly. Carlton was trying to slow the game down, but it was an approach that played into the Tigers' hands as they pressured the Blues' inexperienced defenders and forced them into turnovers, playing the game in their own half. The Blues entered the half-time break in disarray, but they would be encouraged by a third-quarter recovery that saw them kick five goals to two on the back of a resurgent midfield. Young gun Jacob Weitering played exclusively as a forward and kicked three goals in an entertaining battle with star defender Alex Rance, but he finished the match with a hip complaint. More pain could come when the Match Review Panel sits on Monday, with key forward Levi Casboult sure to be scrutinised for a high bump on Tiger Nick Vlastuin. The Blues were well-served by captain Marc Murphy (35 possessions and seven clearances), midfielder Bryce Gibbs (26 and seven), and ruckman Matthew Kreuzer (39 hit-outs and two goals). Defender Caleb Marchbank kicked on from a strong pre-season to impress with 19 possessions and eight marks, positioning himself well in an under-siege backline. Prized draftee Sam Petrevski-Seton (11 and seven tackles) made his debut despite missing the entire JLT Community Series, but he showed promise with his dash and clean hands. Defender Harrison Macreadie made his AFL debut as a late inclusion for Jed Lamb (knee soreness), as did ex-Giant Jarrod Pickett. "We had five teenagers, about seven [players] under 21, and three debutants," coach Brendon Bolton said. "You saw our future and they weren't totally intimidated. "We've got to tidy up our ball use, as some turnovers hurt us the other way, but I think you saw our future." Carlton: Jacob Weitering received a knock to his hip in the opening minute but was able to play out the game and should be fine, according to Boltond. Jed Lamb, who was withdrawn late, had swelling in his knee but the coach confident he would only miss one match. Richmond: The Tigers escaped injury free, but recruit Josh Caddy did spend time on the sidelines getting attention to a calf. He also played out the match and Hardwick was not concerned. The Tigers return to the Thursday night stage to take on Collingwood in round two and will not want to be reminded of their one-point loss in the same fixture last year. Carlton takes on Melbourne at the MCG on April 2, giving them a 10-day break.